After wowing both audiences and critics, and garnering seven Academy Award nominations, The Martian returns today on Digital HD, DVD, Blu-ray and 4K Ultra bigger and better than before. Released by Twentieth Century Fox Home Entertainment, The Martian Extended Edition features ten minutes of brand new footage and over two hours of special features. In short, this is the version of the film fans have been waiting for. Based on the novel by Andy Weir, Ridley Scott’s The Martian is one of those rare science fiction blockbusters where the star-studded cast takes a backseat to the science itself. When a violent storm interrupts a team of NASA astronauts conducting research on Mars, the evacuating crew reluctantly leave Mark Watney (Matt Damon), who was hit by flying debris from their own antenna, behind under the presumption that he is dead. Little do they know that Watney has actually survived the freak accident and is stranded on the arid planet. With death looking imminent, Watney uses his scientific ingenuity to do everything he can to overcome the harsh conditions. Meanwhile on Earth, an embarrassed NASA scrambles to salvage a rescue mission before it is too late. 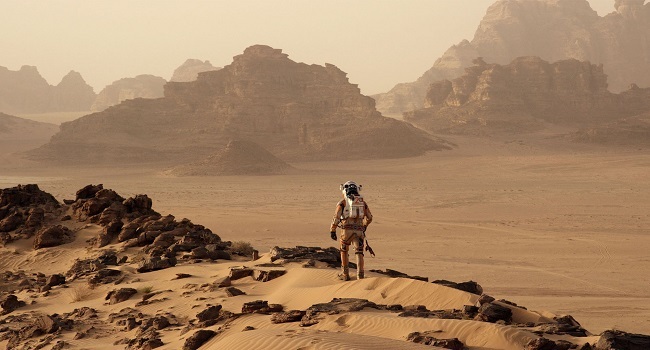 The Martian is a film that excites and entertains science enthusiasts and average viewers alike. Science is not simply a tool for saving Watney’s life, Scott’s film makes it downright cool. Playing like a botanist version of MacGyver, the ingenious ways in which Watney, and the folks at NASA, manage to tackle each new problem that arises is exhilarating to watch. Presenting the science in a digestible manner, while never talking down to its audience, and featuring strong performances from the ensemble cast, The Martian is more than your typical blockbuster. The 2-Disc Blu-ray is packed with plenty of treats to keep viewers satisfied for hours. Fans will take delight in listening to the informative Blu-ray commentary track by director Ridley Scott, writer/executive producer Drew Goddard and author Andy Weir. There is also an interesting Q&A panel discussion with NASA experts regarding the planned journey to Mars, as well as a documentary on how the planet was recreated for the film. Damon does an incredible job in the film. The whole cast is solid. Agreed, I think this is one of the best films he’s been in. I just saw the film and man, it was better than I thought it would be. Plus, I just love the running gag Ridley Scott did as it relates to Matt Damon’s disdain for disco. If I remember correctly the disco gag was a thread in the book as well. I thought the film was a nice reminder of just how good a director Ridley Scott is. I haven’t enjoyed a lot of his work lately but this film I think is the best thing he’s done in a very long time. I hope the extended version has more disco gags. My mom was hearing the music in the next room as she was like “turn that up” as those disco songs are her jam. I loved the book, so it was a relief to see that the movie turned out so well. They were able to maintain some of the science while also creating a commercial movie. That isn’t easy to do. Are the extra 10 minutes worth seeing? I think the extra minutes are worth seeing. They will not impact your overall love of the movie, but are interesting in regards to the thought process of what directors and editors choose to leave out of certain cuts of a particular film. The special features are the main reason to get this version though. I can’t believe I still haven’t seen this movie! I’m planning on doing a full Ridley Scott marathon sometime soon. It’s amazing that at his age he still has the same energy he did to direct epic movies like this.